In Touch Billing is one of the fastest growing medical billing and coding services in the United States. Our core competency lies in providing high quality end to end billing and coding services for all healthcare specialties including emergency departments, radiology, ambulance coding and HCC coding services. In 2016 alone, our systems and proprietary processes have resulted in over $1 billion being billed out to payers. You are in good hands. All the CPC and COC certified coders at In Touch Coding have successfully completed the AAPC ICD-10 proficiency assessment and have a proven track of record of coding ICD-10 with more than 98% claim submission accuracy, having worked on millions of claims. It is important for a coding and billing service provider to work closely with clinicians, and the front desk staff in order to maximize every avenue for reimbursement. We consider it our professional and personal responsibility to stay current with ever-changing payer guidelines, so you don’t have to. By sending clean claims on time through In Touch Billing and Coding Services, you will not only reduce claim denials, but also get paid more, faster. Our ED coders are experts in reviewing the documentation and identifying appropriate code levels, and there is zero probability of up-coding or down coding. We are experts in ACR guidelines, bundling and unbundling procedures and appending appropriate modifiers like 26, 76, 77 and 59. Seven categories of ground ambulance services refer to both land and water transportation. Code selection depends on services rendered and patient’s condition at the time of transport. We can extract all HCC codes to support Medicare Advantage plans, help to complete accurate risk assessment of their membership, and submit complete, accurate claim data prior to CMS deadline. To properly determine E/M levels, it’s important to understand the presenting problem, history, and findings of the physical examination. Taken together, these elements determine the level of clinical decision-making. They present a more complete picture of the problem and the care required during the ED stay or the level of follow-up/disposition required. In Touch Billing provides a high quality medical coding service for emergency department physicians and facilities nationwide. Our radiology coders can code for a variety of services, including diagnostic radiology (plain film), diagnostic ultrasound, computed tomography (CT), magnetic resonance imaging (MRI), diagnostic nuclear medicine, positron emission tomography (PET), and mammography. The American College of Radiology (ACR) has established several guidelines for billing and coding. We are experts in ACR guidelines, bundling and unbundling procedures and appending appropriate modifiers like 26, 76,77 and 59. We also understand the most appropriate unit allocation for CPT codes. Our coders have extensive knowledge and experience in reviewing the ambulance documentation to select the most appropriate CPT code. Did you know that it is considered inappropriate billing, if an ambulance provider uses a modifier that does not describe the origin and destination? 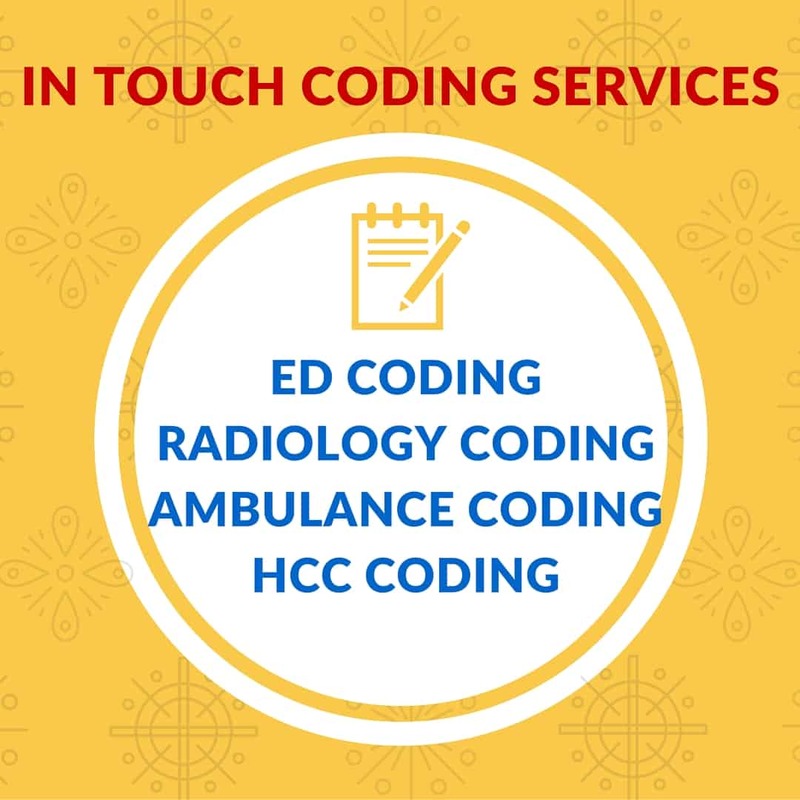 The entire coding team at In Touch Billing is well versed with ambulance modifier usages. Expect consistency, reliability with our work, and quick timely payments. We can extract all HCC codes to support Medicare Advantage plans, help to complete accurate risk assessment of their membership, and submit complete, accurate claim data prior to CMS deadline.We have a vast amount of experience in handling different types of documentation with different client guidelines. With the implementation of ICD-10 codes, and mapping of patient diagnosis, capturing accurate information regarding the patient has become extensive and complex. Our experienced HCC coding team can help you to overcome these complexities and code with 95% and above accuracy consistently. 10 Minutes Can Slash your Billing Costs by up to 20%.. This no-obligations 10 minute call has helped organizations discover ways to reduce costs, and increase monthly revenue.. and now it’s your turn. When an integrated software suite (EMR, scheduler and billing software) combined with a meticulous billing service, your practice can save tens of thousands of dollars each year. Learn more, in this free, no-obligations ‘billing analysis’ call. We’ll tell you how you can increase your revenue, and if you decide to work with us, great! If no, not a problem. This is a no-obligations, no pitch, no pressure phone call.